Trail running shoes are specialized running shoes that are designed to help you run safely on rough terrain. If you're thinking about running in the woods, completing your first trail race or just looking for a versatile shoe, trail running shoes may be the best choice for you. How are trail running shoes different from road running shoes? At first glance, trail running shoes may look very similar to your road shoes (hello, bright colors) but it's what's underneath that really sets them apart from the pack. Outer Sole: The outer sole (bottoms) of trail running shoes have lugs that help you maneuver through tough terrain. Many of them use rubber on the outer sole to help absorb shock and protect your feet from rocks. Upper: The uppers on trail running shoes are usually a combination of breathable and water-resistant fabrics. They usually have some sort of protective material at the front of the shoe to help prevent your toes from popping through - because no one wants holes in their shoes. Mid-sole: In addition to the foam midsole you're used to in your road shoes, some trail running shoes have rock plates to help keep you stable on off road terrain. Drop/Offset: A drop in a running shoe can be described as the distance between the heel and the forefoot. Many traditional road shoes have 10mm or 12mm drops - designed with heel strikers in mind. In trail shoes, it's not uncommon to see lower drops because our stride and foot strike typically changes on trails. Stability? : If you're normally wearing a stability road running shoe, a may be a little harder (but not impossible!) to find trail running shoes with medial postings. As mentioned above, our stride normally changes on trails. How do I know which trail shoes are good for me? It's simple. The trail running shoes that feel comfortable on your feet are the ones that are good for you. Most (medium to high priced) trail running shoes will last for 300-500 miles so don't worry too much about durability. Pro-tip: When you get fitted for trail running shoes, make sure you have a half-thumb or full thumb worth of space at the front of the shoe. There's nothing worse than getting blisters, black toenails or losing toenails because your shoes are too small. How do I get a good pair without breaking the bank? Trail running shoes, like road shoes, are a piece of equipment that help you perform better at your sport. They're an investment that protect your feet from injury and make you feel pretty cool every time you lace them up and go for a run. If you come across a good deal, GREAT! Otherwise, plan to spend at least $100 for a good, durable pair. Can you run trails without wearing trail running shoes? If you're on the fence about making an investment in trail running shoes but still want to give the trails a try, it's okay to run in your road shoes. Unless you're running on some serious technical terrain (uncommon in big cities), a road shoe will be fine the first few times. Try going out on a day when the ground isn't wet and the paths are clear of debris. If you decide that you LOVE trail running, make the investment on a good pair. This list contains affiliate links. Meaning if you purchase one of these bad boys using the links below, you'll help keep the lights on this site. 1. Hoka One One Stinson 3 $160: If you like cushion, this shoe is for you. The Stinson is a high-cushion shoes that's great for road and trail. It featured Hoka One One's late stage Meta-Rocker technology and has a 6mm drop. 2. Nike Zoom Air Terra Kiger 3 $125: Lightweight and fast - The Kiger is everything you want in a running shoe - lightweight, cushioned, and responsive - combined with sharp lugs designed to get a good grip. The rubber waffle outsole makes it great for the trails. It has a 4mm drop. 3. Saucony Peregrine 6 $120: Like many of Saucony's road shoes, the Peregrine has an Everun midsole to give your shoes an extra bounce and responsive feel. It has a a 4mm drop and a rock plate to keep you stable. 4. Altra Lone Peak 3.0 $120: For the 0-drop runner. If you like a shoe with a wide toe box AND no drop at all (distance between the heel and the toe), then Altra's are for you. The Lone Peak 3.0 has moderate cushioning, lugs on the outer sole, and a breathable mesh to keep your feet from sweating. If you're not used to running in a 0mm drop shoe, this shoe may have a longer transition period. 5. Topo MT-2 $100: Offers comfort, performance, and versatility on light trails. The upper boasts breathable mesh, midfoot overlays, a fully gusseted tongue and a roomy toe box. 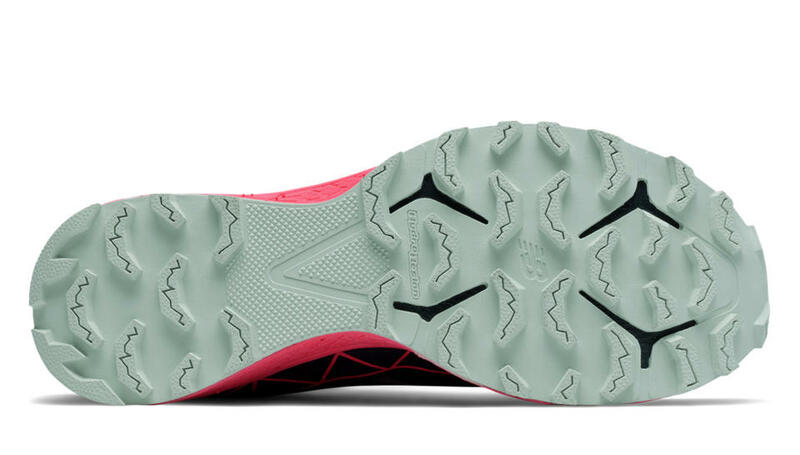 The outsole uses multi-directional lug traction, forefoot flex grooves, and mud release features, optimizing rubber surface area for durability and grip. 6. Brooks Cascadia 11 $120: Includes a four-pivot system that acts like a personalized suspension system on tricky terrain, a ballistic rock shield to protect feet from hazards, and a rugged outsole that provides great traction on wet surfaces. The Cascadia has a 10mm drop. 7. Vazee Summit Trail $100: A RockStop plate and Toe Protect help keep out trail debris, while the lugged outsole is a must as you move through challenging terrain. Combined with REVlite cushioning for comfort and a sleek, streamlined fit, the women’s Vazee Summit has all you need to forget about your feet and focus on the view.